Part two of my data analysis for Democratic Audit (8 August 2013) on MPs’ geographical roots, considering where MPs went to university and worked before their election. I found, in particular, that the southern regions of England are over-represented in MPs’ employment and academic backgrounds. 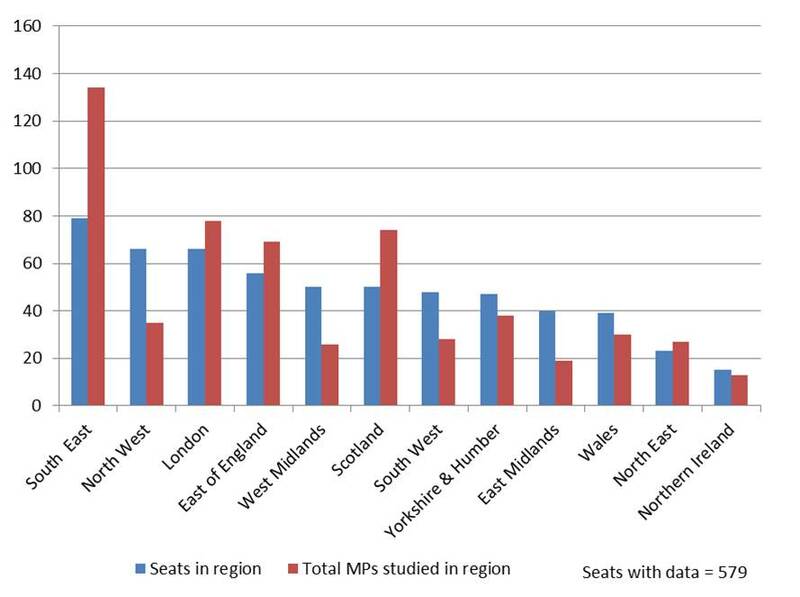 The first part of this analysis of MPs’ geographical origins showed that only half of MPs were born in the region they represent in Parliament. A similar number attended school in their home region. This is not necessarily a worrying sign for democracy, as the legislature benefits from containing members with a wide variety of past experiences, although it is at odds with the claims about local roots we hear from many MPs. The biggest danger lies in the possibility that particular regions are significantly over- or under-represented in MPs’ backgrounds. This second post considers the data on where MPs went to university, and where they worked prior to entering Parliament. How many MPs studied or worked within the region they represent? The data shows how many MPs attended university or worked within the region in which their constituency is located. Where available, the data includes the first two universities attended by each MP, and the location of their most recent job before becoming an MP. It is important to note that the job data in particular provides only a snapshot of MPs’ careers; it is likely that a number would have worked in different regions in earlier jobs. The university figures show that 43% of MPs studied in the region they represent. 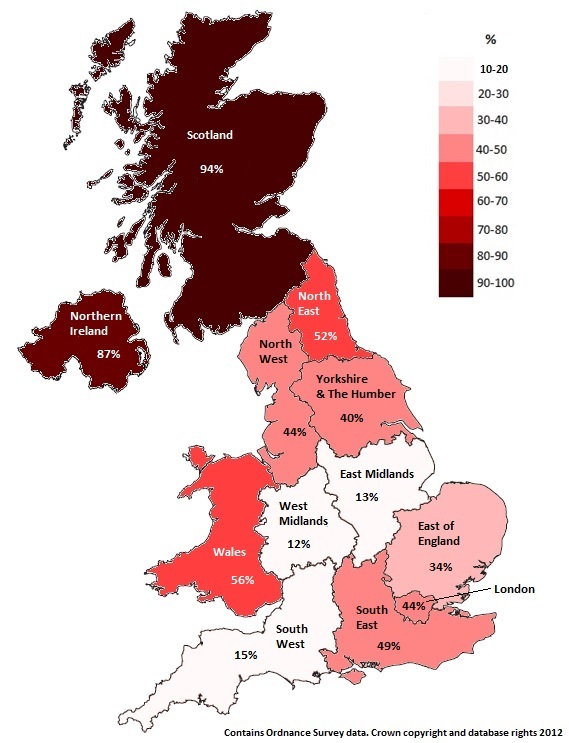 The average for just the English regions drops to 35% – Scotland (94%) and Northern Ireland (87%) have high proportions of MPs educated locally. 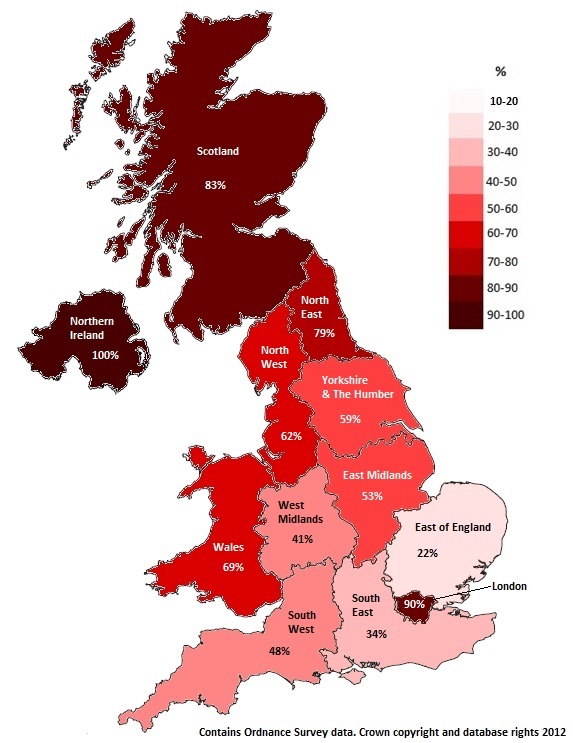 Within England, the North East (52%) and South East (49%) are the regions with the highest proportions. The map below illustrates the findings for each region. The employment figures show that MPs are more likely to have worked in their home region prior to being elected, than to have studied there. Considering the UK as a whole, 58% of MPs worked in the region they represent. Again, Scotland (83%) and Northern Ireland (100%) rate highly on this measure, while the average for the English regions as a whole is 53%. The England figure is skewed somewhat by the 90% of London MPs who worked in the capital, as we will explore further later. The map below illustrates the findings for each region. Discrepancies are apparent when we compare the size of each region compared to the number of MPs educated there. The table below shows the number of parliamentary seats in each region (including only those where data for the sitting MP is available) alongside the total number of MPs attending university in the region (first university only). Scotland is over-represented on this measure, as are the East of England and South East – figures for the latter two are likely to reflect the popularity of Oxford and Cambridge universities among MPs, which is explored further later. The most striking feature of the employment data, also shown below, is the significant over-representation of London. The prominence of the South East and the East of England in MPs’ academic backgrounds can be explained in large part by these regions being home to Oxford and Cambridge universities. Oxford accounts for 77% of the MPs attending their first university in the South East; Cambridge accounts for 81% of those in the East of England. In total, 31% of all MPs attending university studied at Oxbridge for either their first or second degree. 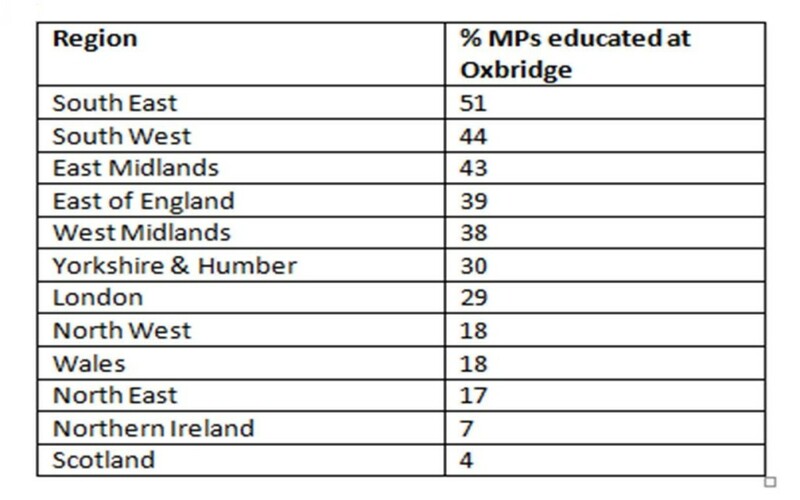 The table below shows what proportion of MPs from each region studied at Oxbridge. It is worth noting that of the two universities, Oxford is more popular among MPs than Cambridge: almost twice as many MPs took their first degree at Oxford. Only 1.4% of undergraduate students attend Oxford or Cambridge, based on UCAS acceptances data from 2012, far below the 27% of MPs who took their first degree at one of the universities. The prominence of Oxbridge in MPs’ backgrounds is, however, mirrored or surpassed in other leading professions. For instance, theSutton Trust found in 2009 that 82% of barristers, 78% of judges, 45% of senior print and broadcast journalists and 39% of FTSE 100 chief executives had attended Oxbridge. 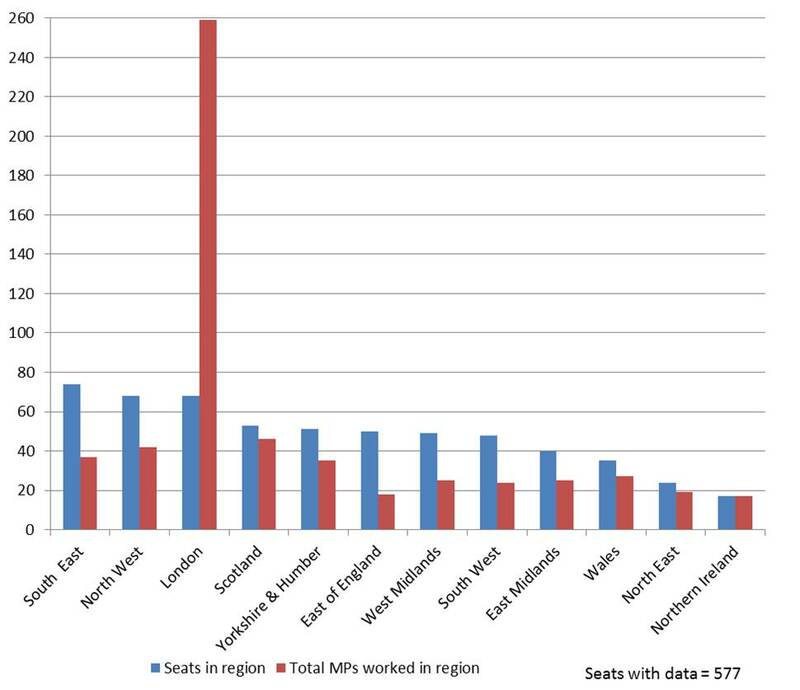 As discussed above, far many more MPs worked in London than there are seats in the region. In fact, every other region of the UK is under-represented according to this measure, with the exception of Northern Ireland. A total of 259 MPs worked in London prior to their election, representing 45% of all MPs for whom employment data was available. Considering just English MPs, this figure rises to 52%. 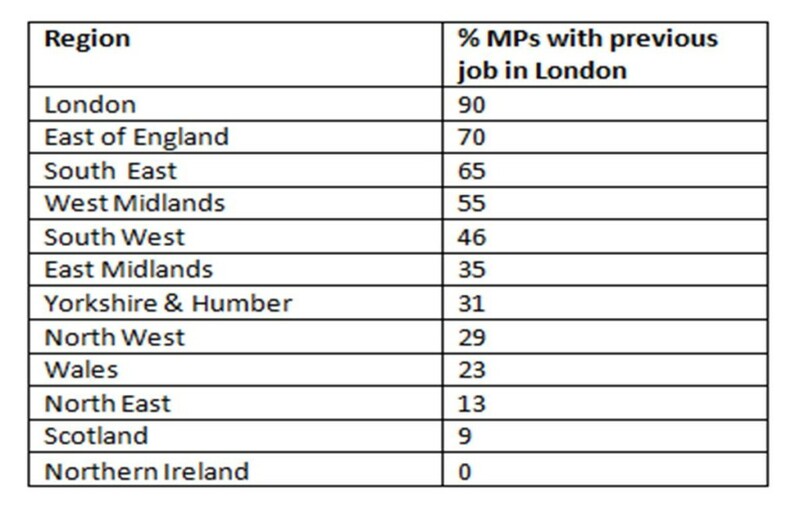 The table below shows the proportion of MPs from each region whose most recent job before becoming an MP was in London. Across the UK population as a whole, 16% of jobs (including self-employment) are based in London. The rate of MPs working previously in London is therefore, about three times this rate. Some reasons may be found by considering the occupational backgrounds of MPs, which has been examined by the House of Commons Library. A large number of MPs have worked in professions centred on London, including in politics (15% of MPs), law (14%) or publishing and journalism (6%). Similar research from The Smith Institute found that 15% of MPs previously worked in the financial services sector, which is also concentrated in London. Note: The data includes all MPs in Parliament on 14 October 2012, where biographical information was available. University data was found for 579 MPs and employment data for 577 MPs. The full, anonymised dataset is available to download here (ods format). 23 September 2013 in Parliament and government, Research.